Product-service system that improves the pick-up experience for both travellers and pickups. 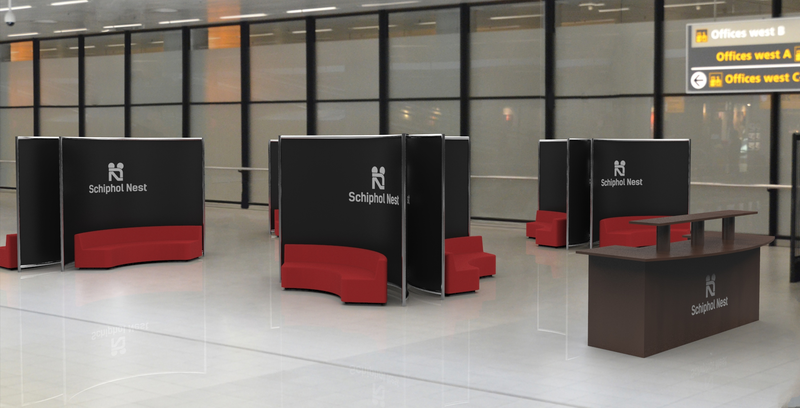 Schiphol Nest is a cross media interaction design that will ensure a better pick-up experience. The main idea behind this concept is that the pick-upper can make a personal and warm welcoming nest while waiting for the traveler. This way, the waiting time will seem shorter, because the pick-upper has something fun to do. They can wait in the comfortable Nest and make it more personal with a welcoming text, pictures, videos from friends and a song. The experience for the traveler will be more pleasant too. He or she can reserve a nest for the pick-upper. This way, the traveler can thank the pick-upper for coming to Schiphol and wait. Also, the traveler is ensured that the pick-upper has a relaxed waiting time. 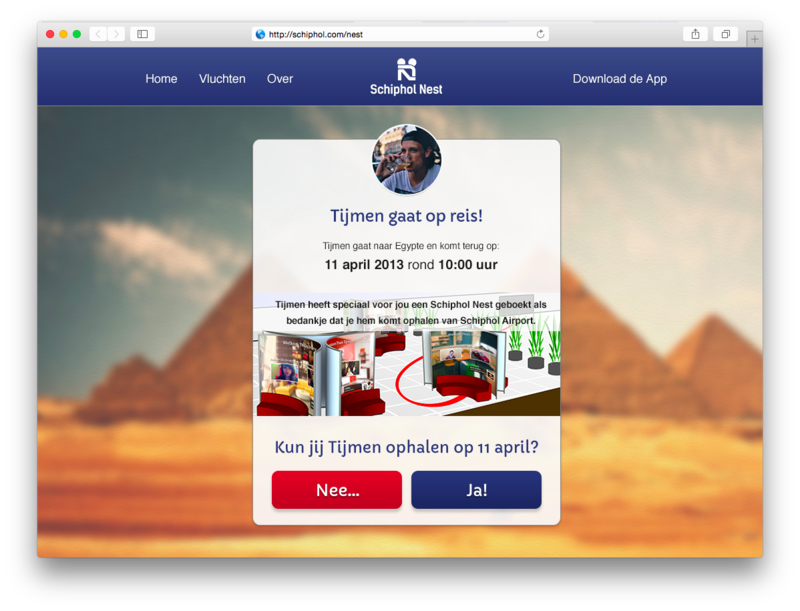 Schiphol Nest provides a better pick-up process, using three touchpoints: A website, a mobile app and the Nest at Schiphol Airport. Schiphol strives to provide smooth processes and good facilities and does everything in its power to guarantee passengers a pleasant journey. This is the Schiphol Airport’s mission statement. With this in mind, the team and I created Schiphol Nest. When looking at the process of picking someone up from and arriving at Schiphol Airport, there is a lot of anxious waiting and uncertainty for both the arriving passenger and their pick-up. The pick-uppers know the arrival’s landing time, but only some are up-to-date about current delays through the website; others just leave home based on the flight plan and good faith. Most can only guess the time between the landing of the plane and the passengers coming through those sliding doors, so they arrive around the plane’s landing time at Schiphol Airport. 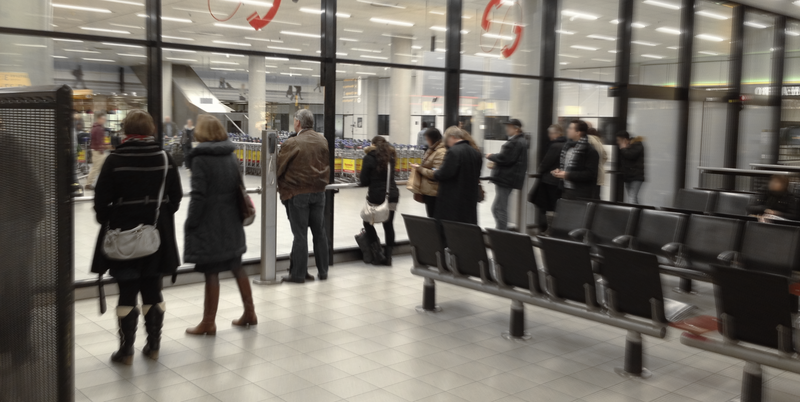 Upon arriving they quickly check the flight status on the big screens at Schiphol Plaza. They estimate a duration and the waiting begins. Some quickly go through a few shops or get a cup of coffee, some others go to the small area where the glass wall to the arriving passengers isn’t blindfolded, trying to recognise any familiar faces. Others sit in the waiting areas between the arrival halls. Most go to the sliding doors at the arrival hall and stand and wait for their arrival, not wanting to miss the moment they come through those doors. Not a single pick-up knows the exact time of their friend entering the hall. The problem with the current pick-up experience becomes clear. It is essentially a series of let downs, disappointments and uncertainties until the moment their arrival comes through those sliding doors. Until the moment the doors start sliding, a pick-up has a mixed feeling of excitement and boredom. They are excited about reuniting with their arrival, but bored because they have been and are still waiting there with nothing to do. Then those doors start sliding, excitement rises, and someone else comes through those doors. A disappointment. Then comes the jealousy, someone else has already reunited. They have seen their arrival, they have talked to them and get to go home again. The problem in the pick-up experience is that it is uninformed, uncertain, boring, exhausting, some excitements, lots of let downs and all for just one big reuniting excitement at the end. It is a downwards mood curve, with a big peak at the end. We think an upwards curve will cause an even higher peak at the end, and the much more pleasant pick-up experience. We want to make the experience of picking up friends or family feel more warm and personal. We envision a tailored experience that provides every pick-up with personal care and information. No matter how fancy or cool this concept is, it will not take away the emotional high-point of the entire journey, the reunion is at the center. 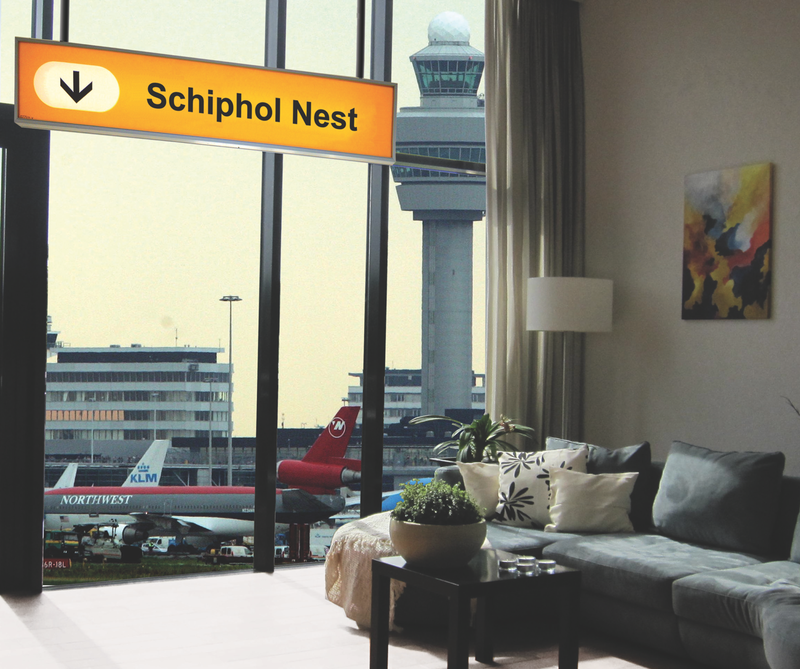 Schiphol Nest will be inviting and obtrusive, making it literally nearly impossible for the user to get around Schiphol Nest. It will be the optimal concept for a waiting scenario. People will love the concept and they will want to use it. This image shows a cluster of Nests in the arrival hall of Schiphol. It’s a relaxing waiting area for the people picking up friends or family. By placing pictures, welcoming texts and personnel welcoming videos from friends on the screen of the nest you create a warm and comfortable place of reunification for you loved ones. Please also have a look at the advertising poster we made. 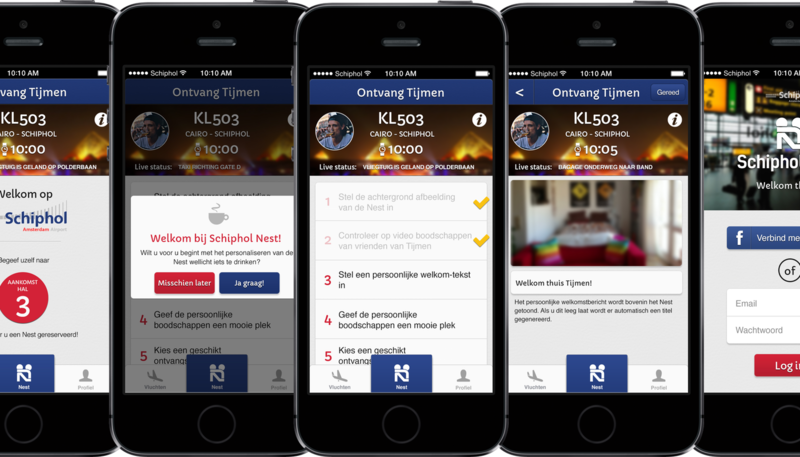 Using the Schiphol Nest application you can customise the screen of the Schiphol Nest. After scrolling through your photos, you choose a fitting background picture and place it on the screen. You watch the sent in video messages and give them a place as well. On the application you also type your own personnel welcoming text and pick a song from your play list. This way the reunification will be 100% personal. Here you can find the prototyped webapp we used in the video. Service for Schiphol Airport, and TU Delft from 2013. Team effort with fellow creators Julian Neef, Tijmen Oudshoorn, Lex Postma, and Harry Roode. In this team I was in charge of video editing and helped conceptualize. Course: Cross Media Interaction Design. Assignment: Explore the process of designing (social) interactions leading to positive, coherent user experiences, using a mix of three platforms which includes something interactive on one or more displays (smartphone displays, tablet, laptop, billboards, etc. ) and something interactive at some public physical location. You can choose your own location. 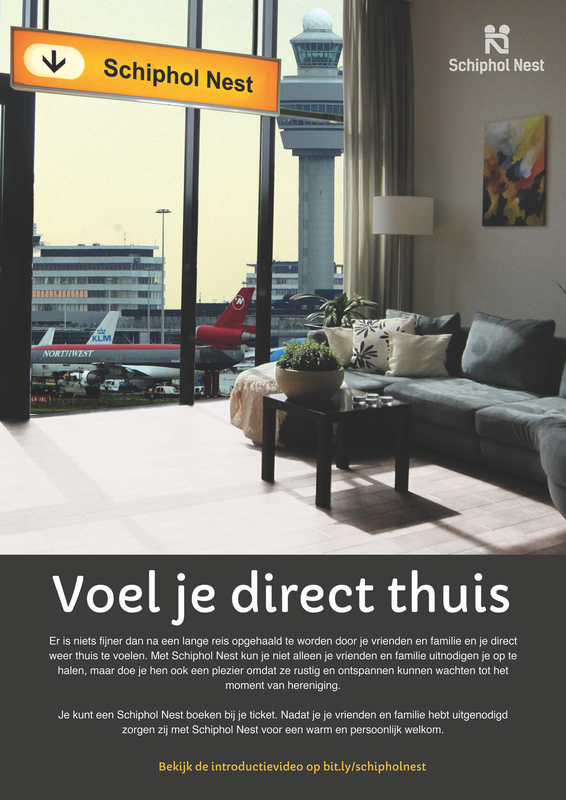 Want to know more about Schiphol Nest? Don’t hesitate to email me.